As we enter into a new administration, the ethics of Federal leaders have come into a stronger spotlight. This got me to thinking about the influence of Senior Executive Service (SES)’s personal values on the ethics of the agency they serve. And, whether those personal values align with the organizational values of the agency. In researching this post, I thought it important to look at the core definitions of ethics and values. Surprisingly (or not) the two definitions overlap to a large degree. Ethics: rules of conduct or principles that guide behaviors of a person or group based on what is considered right and wrong. Values: principles or standards of behavior with regard to what is considered worthy, useful, important, and good. So why does it matter whether the personal values of a SES align to the organizational values? Organizational values are typically determined by a collective of employees who define what the agency will reward, accept, and pay attention to. These organizational values send a message about how decisions are made, where resources will be placed, and how success is defined. The personal values of an SES, conversely, are a combination of his/her upbringing and their personal and professional experiences over time. The meaning of these values and how it impacts their leadership is unique to them. Further, these values continue to evolve over his/her career. In agencies where the SES’ personal values and the organizational values align, the workforce can reasonably be assumed to remain ethical. Admittedly, there remains a risk of how the leadership and employees enact those values which can become unethical. But that is for a different post. Trouble arises when there is a misalignment between what the agency’s collective has said is valued and what the senior leadership values. This is because the leader may pursue their personal goals which include behaviors the organization might not want to encourage. Imagine that SES Francine values loyalty above all else. Loyalty can be defined as faithfulness to commitments and obligations. Further, loyalty might include expectations of support and allegiance. SES Francine then takes a position with a new agency, who’s core value is openness. Openness in this instance might be defined as an emphasis on transparency and unrestricted access to information. It might also include an expectation of collaborative management and decision making. Taken separately, these two values can drive good, fair, and ethical behavior. Taken together, they could drive behaviors which conflict with each other. SES Francine may perceive that employees who openly disagree with unilateral decisions she made as a breach of loyalty. Based on her personal values she may unconsciously (or consciously) punish these employees who openly disagree. As this goes on over time, an increasing number of employees will place more emphasis on demonstrating their loyalty. They do this as a means to be successful, gain praise, and avoid punishment. As more employees shift their behaviors, so too does the culture of the agency. In this transitional period, those who value openness will perceive those who are honoring allegiance as unethical. And, vice versa. As the clarity of what is right and wrong in the agency becomes cloudy, so too will the ethics of the workforce. Although organizational cultures are difficult to change, SES and senior leaders shape the ethical boundaries of it’s employees. 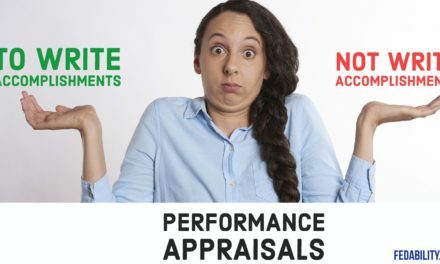 An article in the Harvard Business Review Who Can You Trust?, cited that people in positions of power often condemn self-interested behaviors from employees but judge their own similar behaviors as acceptable. In short, the SES may be unaware of the impact of his/her personal values on the changing organizational culture. I cannot think of a single SES who set out to apply his/her values to an agency with negative intent. But, I’ve seen it happen. The advice then is an explicit examination of one’s personal values. Take time to define the values for yourself. Describe some behaviors that reflect what that value would look like in the work place. Find stories of when those behaviors are used and what the outcome is. Tell these stories whenever possible as a way to share with employees. Reflect on the negative side of your values. If taken to an extreme, what are potential negative outcomes? Recall our story of SES Francine. Her positive personal value of loyalty was taken to an extreme and she quickly became the Emperor with New Clothes. With a greater insight into the negative side of your personal values, focus on mindfulness within your role. That is, remain vigilant in whether these negative signs are appearing. Just as I recommend to the SES, it’s important you understand your own personal values. Take time to define the values for yourself. Describe some behaviors that reflect what that value would look like in the work place. Reflect then on whether you see examples of your values demonstrated within the agency. Investigate what the values are of the agency and your leadership. 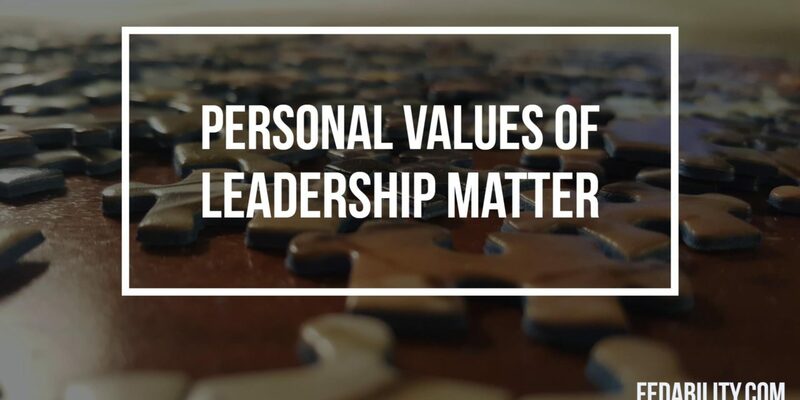 While you could ask your leadership these values, you may not get a complete answer. Instead, observe what is rewarded. Keep an eye out on which budgets get cut during shortfalls (these are things that are not valued as highly). Observe how decisions are made and shared. Take an honest look at the alignment of your personal values and the values reflected by your SES and the agency’s culture. Chances are if there’s a misalignment, your gut already knows you aren’t a good fit. At that point you have three options. Live in-authentically. Realize that you will be asked to do things that will conflict with your own values. Know that you may have to compromise your own values. Attempt to influence the culture. If you are in a management position, focus on the values of those whom you hire into your own team. Work to influence what is valued and rewarded by other managers and the senior leaders. Find another agency that fits with your own personal values. While changing jobs is a pain, it’s far easier than working in an environment that doesn’t mesh with what you value. Like this post? Consider signing up for our weekly newsletter. Each week you’ll get updates on our newest posts. You’ll also receive access to our newest free give-aways. I promise not to spam you or sell your contact information to anyone. Own your power. 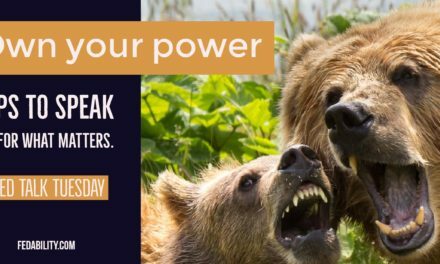 Be a ferocious mama bear. Tips to speak up for what matters.